For reference it's probably worthwhile citing 19th century CP/SP roundhouse photos that have been published. Los Angles roundhouse on pg. 15 of "The Southern Pacific in Los Angeles" there is an interruption in the tracks due to what is apparently a little park to the right of the roundhouse. This park can also be seen in the photo of the LA roundhouse on the bottom of pg. 50 of Signor's Tehachapi book (a photo possibly taken in the 1880s). Pg 24 – identified as Sumner (Bakersfield) – either a 9 or 10 stall wood roundhouse – note small trees planted. Also I think the loco closest to the roundhouse is El Gobernador. Pg 25 shows the turntable – but can't tell if it is a Sellers cast iron table or not (my guess it that it is). Pg 46 shows a very work SP 9 stall wooden roundhouse at Mojave. Pg 66 shows Bakersfield shops and back side of roundhouse – turn of the century at a guess. Note brick building in middle. Pg 19 – Rocklin stone roundhouse with wood A-frame turntable, ca 1867-68. Hart #241. Pg 26 – Cisco 2-stall enginehouse in ca 1867-68. Hart #185. Pg 33 – Cisco 2-stall enginehouse in ca 1867-68. Hart un#. Pg 42 – At Carlin, perhaps the roundhouse in background on top right. Hart #345. 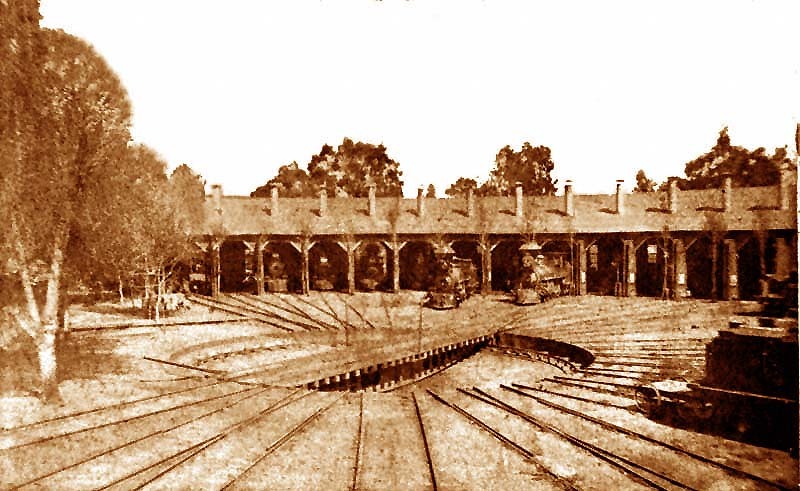 Pg 43 – Sacramento roundhouse, probably in 1880s based on trees. Pg 48 – Wood roundhouse at unknown location in Nevada. Pgs 72-73 – Truckee stone roundhouse, including view in balloon track. Pg 74 – Terrace wooden roundhouse ca 1870. Pg 82 – CP/Stevens 4-6-0 #177 on Sacramento turntable (a cast iron Sellers) with roundhouse in background. Pg 86 – El Gobernador on the Sumner (Bakersfield) turntable, a cast iron Sellers design. ... On that same thumbnail index is a great picture an an early wheat combine (combination cutter and thresher) – which relates to that discussion about bag or bulk wheat. Talk about a hot and dirty beast to manage! And, having mentioned bag vs bulk wheat– over on the 4L discussion group there has been some discussion of shipment of sawdust/wood shavings in the 19th century. There seems to be agreement that there was a market for such (saloon floors, insulation – either in buildings or in the shipment of ice – packing grapes). However, I suspect most (if not all) was obtained from local sources (local planing mills, box factories, furniture or wagon makers, or – in the case of the Truckee ice plants – local sawmills) and did not require rail shipment. Have any of you run across mention of shipping sawdust/shavings that would suggest how it was shipped (bulk, sacked, barrels)??? I mentioned that the market was probably small and local from the experience of the American River Land & Lumber Co's mill at Folsom. That mill was (reportedly) the world's first all-electric sawmill, and it failed primarily because it became plugged up with its own waste. Without boilers to burn its waste, and prohibited from dumping the waste into the American River by the fish and game commissioner (apparently the first intent), and UNABLE TO FIND A MARKET for its waste, the mill was soon moved to Pino Grande and converted to steam. I suspect everyone in Sacramento who needed sawdust could find all the needed in the many wood-related factories in Sacramento. The LA Roundhouse was wood, so it is not to be ruled out. Enclosed is a piece that summarizes the SP roundhouses from which to choose. But we also need to include Lathrop. The picture could be Tulare, but the tell-tale trees make me think we are looking at LA. Courtesy Tulare Public Library and the Merv Fulton Collection.